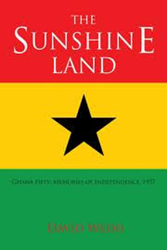 David Wedd, a British intelligence officer in 1956, recalls Ghana’s Independence from Britain in his new book. ...I quickly fell in love with Ghana, its land and people. When author David Wedd recalls memories from his childhood, his include traveling to West Africa’s Gold Coast and exploring the country with an army. In “The Sunshine Land,” Wedd describes his exploration of the rain forest and Africa’s wildlife, while he journeys north to the Sahara Desert and Timbuktu. Along his path, he encounters many interesting people and experiences, including a witch doctor and Kwame Nkrumah, Ghana’s first ruler. Sixty years ago, David Wedd was a young army officer in West Africa’s Gold Coast, when the country became Ghana, the first black African colony to gain Independence from British rule. Wedd served as an Intelligence Officer in the British Army in 1957 and fell in love with Ghana and its people. To learn more about the author and his book please visit, http://www.authorhouse.com/Bookstore/BookDetail.aspx?BookId=SKU-000223896.